We recently read about a woman in Venezuela who gave birth while waiting in line to buy food and staple items. Despite being 9 months pregnant, the woman reportedly arrived at dawn to wait in line overnight so she could buy necessary products at more affordable prices. We don't know where her husband was, but the good news is that other people in line assisted with the birth and the woman and baby are doing fine. While it's admirable that her fellow line-waiters helped her, the story is nonetheless a sad social commentary. In the banking industry, waiting in line carries its own troubles, albeit nothing as dramatic as what happened to that woman. As branch lines have moved outside to ATMs and then to online and phone channels, banks are trying to respond by finding ways to eliminate lines and reduce customer frustration. This makes sense because there's no shortage of scientific research on the angst brought on by being forced to wait in any line. In this area, a new virtual queuing application from the State Bank of India recently caught our eye. It lets customers book an instant queue ticket for certain services at selected branches. Here's how it works. The customer begins by selecting the type of service needed from a menu in an app. This brings up a list of branches located within about 9 miles of the customer that provide the desired service. The customer then chooses a branch location based on information provided within the app, including expected wait times, the number of customers waiting and the distance to the branch from the point of booking. Once the customer arrives at the branch, he or she simply activates his or her Q-ticket and is serviced immediately, thus avoiding lines. The technology allowing for mobile or online scheduling has been available for a number of years, but banks have been slow to adopt. According to a Celent survey, only 33% of the largest US banks offer digital appointment booking and adoption among other banks and credit unions is rare. The opportunity may be there, however, especially with so many banks rolling out mobile banking apps or upgrading existing ones. While it takes coordination on the bank's part to ensure smooth sailing, some customers seem to appreciate the ability to book appointments from their phones and reduce wait times. Banks that do a good job here may have the potential for increased customer engagement and sales growth. You also can improve the effectiveness of your frontline staff and boost customer satisfaction. One cautionary note: If you are going to offer customers the ability to make appointments on their phone or online, make sure it's a seamless process for them. Several banks that tout the availability of online appointment booking don't prominently display its availability on their website. That makes it more difficult for customers to use the service. 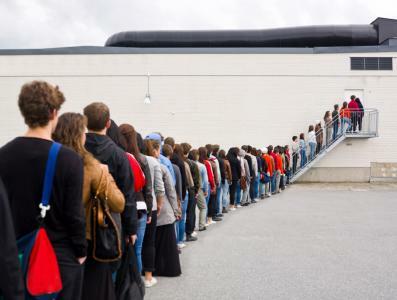 If customers have to spend time trolling around your mobile app or website to figure out how to make an appointment, they may as well be waiting in line and frustrations will increase. There are many things happening in the industry, but when it comes to mobile and online appointment booking, perhaps more banks should explore this technology. Yields dropped 2bp as investors await the outcome of Friday's jobs report amid global growth concerns. 1) Investors Bank ($21.1B, NJ) will acquire The Bank of Princeton ($1.0B, NJ) for about $154mm in cash (40%) and stock (60%). 2) Wesbanco Bank ($8.5B, WV) will acquire Your Community Bank ($1.6B, IN) for about $221mm in cash and stock or about 1.73x tangible book. 3) Revere Bank ($1.1B, MD) will acquire Monument Bank ($514mm, MD) for about $65mm in stock or roughly 1.61x tangible book. In what appears to be one of a handful of successful federal prosecutions of bank executives tied to the financial crisis, the ex-CEO of TierOne Bank (NE) has been sentenced to 11Ys in prison for fraud. The bank had $3B in assets at its failure and a jury found the CEO guilty of 12 counts of fraud related to fake accounts he used to hide uncollectible loans. Given fewer Wall Street firms to support activity in the Treasury market and concerns about volatility as a result, the Financial Times reports the US Treasury is reportedly considering such changes as replacing old debt with new benchmark securities (to enhance liquidity) and other overhauls. Bankers will be interested to know that the Wall Street Journal reports online lender Prosper Marketplace has announced it will cut 28% of its staff and shift around executives as it seeks to address a drop in loan volume. The move comes as investor interest in buying such loans has declined, as risks have shifted and returns have increased in other investments. Prosper originated $6B in loans last year. In similar news, online business lender OnDeck Capital reported investor demand has also declined for its loans this year. A survey of family businesses by Kreischer Miller finds current owners of such businesses say their most likely transition plan for the company is: transfer to family (55%), no plan (18%), sell to a third party (17%), form an ESOP (4%), or sell to management (2%).